Net Promoter Score (NPS) is consistently one of these metrics. Why? Because NPS packs a big punch in a small package. Its 0-10 ranked question “Would you recommend X product/service to a friend or colleague?” and open ended response field provide a telling benchmark on how your customers are feeling about you. And this trend over time, along with the richness of comments directly from the mouths of your customers, can be a guidepost for not only how your product or service is resonating in the market, but what specifically you should be focusing on to make your customers even more excited about you…and therefore more loyal. A B2B company starts tracking Net Promoter Score in their web application using Wootric. They have access to feedback in real time from users as they experience the product. One day they have a long service interruption. They know they’ll have unhappy customers, but it feels even more real (and shocking) when they see that unhappiness manifest itself quantitatively — their NPS scores tank. Major business crisis? Of course. Recoverable? Depends. 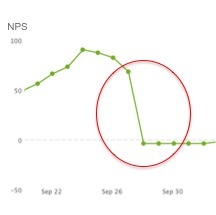 Interestingly, the qualitative NPS comments provided valuable color behind the low scores: while their users were inconvenienced by the disruption in service, they were actually more upset by how the company communicated the crisis. NPS gave them the gift of insight to reach out quickly, explain, apologize and win back confidence. Sure, without NPS they might have seen the impact of the interruption down the road, maybe the following month when subscribers dropped off (and some did anyway). But, they might have attributed it to just the service interruption. NPS allowed them to address an important root cause for the dissatisfaction, and save some customer relationships from souring in the process. Their scores are still stabilizing, but the important part is they are recovering. And they have their NPS score benchmark to help them know when they’re healthy again. The short of it…start measuring! Net Promoter Score is by no means a perfect metric and it can’t be the only thing you measure. But it is an amazing foundation on which to build a culture of listening to and engaging with your customers. It’s easy to understand. It’s both quantitative and qualitative. It’s something that everyone from product, to marketing, to customer success, to the management team can rally behind. Signup for Wootric for free.